Takino introduces their hi-tech Men's Dress Hidden Pocket Shirts; Wrinkle free shirts, Egyptian Cotton shirts, Stain resistant shirts for travel shirt and dress and casual shirt needs. Takino shirts now available online! Buy hidden pocket men's shirts here! The largest & most popular global fashion trade fair. We are living in the age of convenience. We are connected, in touch, wired, online. And with these accoutrements of modern life come clutter, bulging pockets, and cell phones and expensive MP3 players destroyed when they slip out of your pocket. One of the most modern countries on the planet, Japan, is well known for its high standard of quality craftsmanship as well as ingenious, functionally advanced design. Forward thinking meets head turning in the Takino Men's dress shirt lines. If you are looking for more luxury and style as well as functionality in your wardrobe, look no further. Currently the only shirt of its kind, the entire line of Takino shirts features special fitted inner pockets that securely carry everything you need without bulging, sagging, or ruining your lines. Designed especially to fit the pdas, cell phones, MP3 players, and other hi-tech gadgets so much a part of your daily life-- Japanese craftsmanship brings you a unique double layer structure that prevent bulges, lumping and stretching. Many are hidden and secure from pickpockets or accidental dropping as well. Style and quality have not been sacrificed in order to create the durability and efficiency of this modern marvel. All the buttons on our shirts are hand-sewn; all our shirts are wrinkle resistant, and some shirts even have high-tech Japanese nanotechnology built into the very fabric to fight and prevent stains and odor. Easily dirtied areas of the shirts are hidden and protected by using special fabric precisely where it's most needed. Takino: Secure and smart with many hidden secrets. Like you. Unseen style; Because sometimes style is about what isn't seen. To read and watch more about takino shirts hidden secrets, click here. Hand-sewn buttons, crisp styling and a modern color pallet are the hallmarks of this great shirt line. On top of that, it comes with a huge arsenal of unseen advantages as well. Not only do these Nano Shirts have ten hidden and reinforced pockets, this shirt line is also treated with anti-bacterial, wrinkle resistant, odor suppressing and stain resistant nanotechnology coating. This is the shirt for the man who knows where he's going and intends on getting there in style. 100% Egyptian cotton dress shirts that look and feel like a million dollars. Soft, elegant and "buttoned-down" in a business-like manner, these 100% cotton shirts are also ready to play even unbuttoned over a t-shirt. We also carry a comfort relaxed cotton line of shirts in a playful pinstripe . We'd like to introduce two styles of Shirt Jacket Travel Shirts this season. First is our amazing 14 pocket shirt jacket travel shirt in playful colors made from 100% cotton for comfort, strength and flexibility. We also call this the "Men's Cargo Shirt". We also have a cotton poly blend travel / multi pocket shirt with ten pockets to ensure you'll have everything you need for travel whenever and wherever you travel in life, without it falling out, getting lost or getting stolen. Easy-care, lightweight fitted 50% cotton / 50% poly material with contrasting, dirt-resisting collar and cuffs, hand-sewn buttons, amazing attention to detail, and a crisp, clean fit. These dress shirts are ideal both today's technology-enabled executives and men who want to stay unwrinkled and crisp for after-hours as well. More About Our Wrinkle Resistant Dress Shirt / Button Down Shirts Here. At Takino, aside from our regular artisan designers, we sometimes call in a "Guest designer" to create a special line of designer shirts. This year's designer created the FIREFLY line for us. Handcrafted of beautifully textured, remarkably soft, lustrous 100% cotton; this line reflects the Japanese designer's playful yet sharp rendition of nature in design. Like the other Takino shirts, this one also has the multi secured pockets. To view a selection from this line, please see the 100% Cotton Embroidered FIREFLY shirt details here. Men's accessories built for your shirt pockets; ultra thin, sleek, strong, fitted. Super-thin and designed for functional efficiency from lightweight calfskin, these durable wallets fit perfectly in the inner pocket of any of your Takino men's dress shirts. 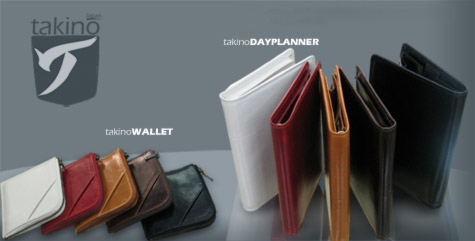 The thinnest day planner available, this lightweight calfskin planner fits perfectly in the outer or inner pocket of any of your Takino men's dress shirts.